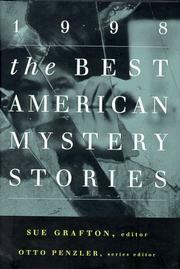 Series editor Otto Penzler, who picked the 50 stories from which Grafton culled the 20 in this volume, has ranged far afield in search of what Grafton aptly calls crime stories, and the rewards are substantial. Scott Bartels's matter-of-fact heroin idyll first appeared in Tamaqua, Merrill Joan Gerber's tale of an ominously pesky fellow-alumnus in Chattahoochee Review, Steve Yarbrough's sorrowful mini reminiscence in Missouri Review, Dave Shaw's droll confession of a chronic slip-and-fall artist in South Dakota Review, Joyce Carol Oates's tormented memoir of a faithless mother in Kenyon Review. Of the entries from more expected sources, the standouts are Smart Kaminsky's unexpectedly bleak quest for a missing wife, Peter Robinson's deceptively mellowed portrait of two old ladies sharing a cottage, and first-timer David Ballard's remarkably assured spin on Roald Dahl's classic "Man from the South"--as well as stories by Lawrence Block, John Lutz, and Donald E. Westlake that can also be found in Ed German's rival The Year's 25 Finest Crime and Mystery Stories (p. 1240). Not the comprehensive yearbook of the genre German produces, but this year, at least, a more rewarding collection of stories.